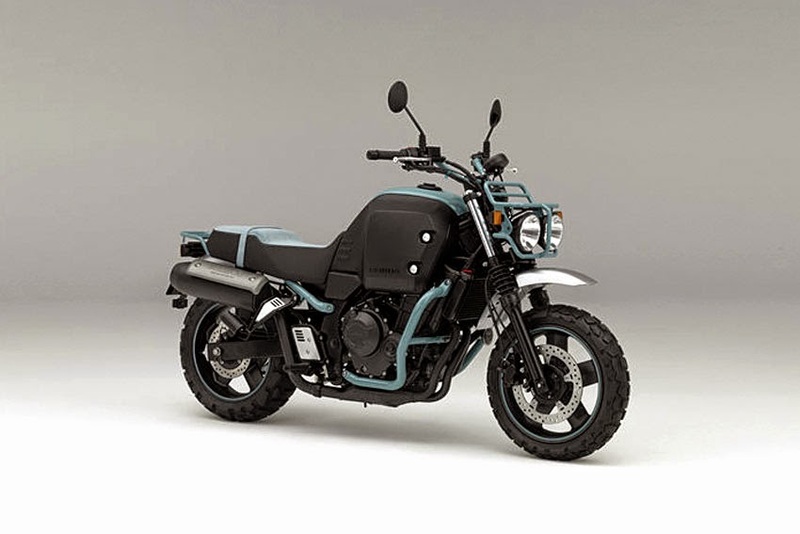 Honda unveiled the world premiere of the Bulldog as an exhibition model (concept model) at the 31st Osaka Motorcycle Show 2015.
was designed to go beyond the boundaries of conventional leisure motorcycles, to actively enjoy outdoor life. The Bulldog's 15-inch wide-tires and low center-of-gravity realize a low, 730 mm seat height, ensuring a solid footing. Its unique robust, yet charming styling undoubtedly brings smiles to the faces of not only riders, but people who don't usually ride motorcycles. The liquid-cooled 4-stroke DOHC inline 2-cylinder 400 cc engine has powerful, yet easy to handle output characteristics, realising a nimble ride in a wide range of environments from urban to rural areas. The Bulldog is equipped with a carrier suitable for camping-touring, and features accessory storage on the sides of the fuel tank, which also act as a styling accent. The Bulldog, a playful, next-era concept model, will be exhibited at 42nd Tokyo Motorcycle Show from March 27, 2015 to March 29, 2015 at Tokyo Big Sight.